My brother's best friend was Billy Lemnitzer. Billy's father was known to me as Colonel Lemnitzer, and Billy's grandfather was General Lyman Lemnitzer, Chairman of the Joint Chiefs of Staff. 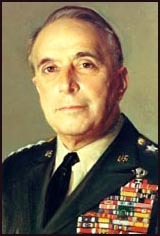 General Lemnitzer was, in effect, the second most powerful man in the United States military. Only the commander in chief held a higher rank. Because of the friendship between our families, my dad was occasionally invited to play poker with the Lemnitzers and other neighborhood men (mostly high-ranking Pentagon officers). Dad told me it never made him feel particularly safe about our nation's security when he could bluff the generals out of the poker pot with a pair of twos.